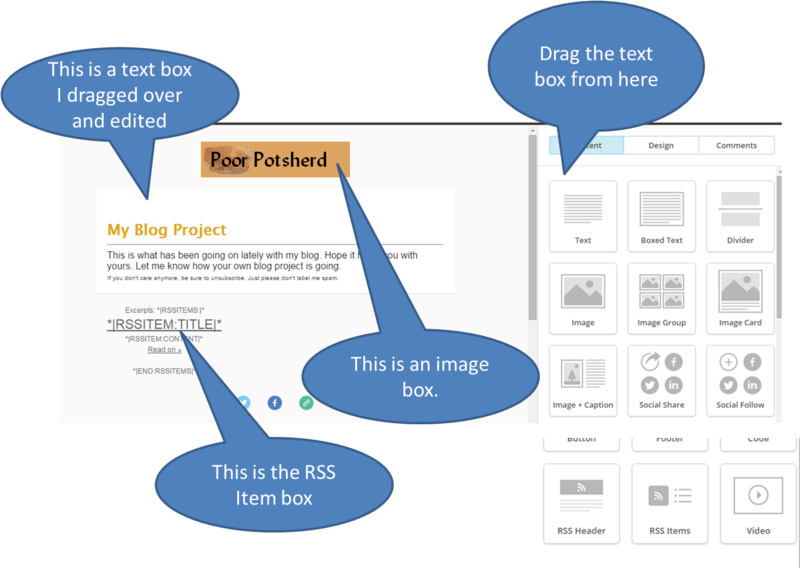 Once I got the correct RSS feed URL for the blog category for my Mail Chimp RSS campaign, I needed to set up my campaign. This is how I did that. You move through the various parts of the campaign but clicking on the items at the bottom of the screen. 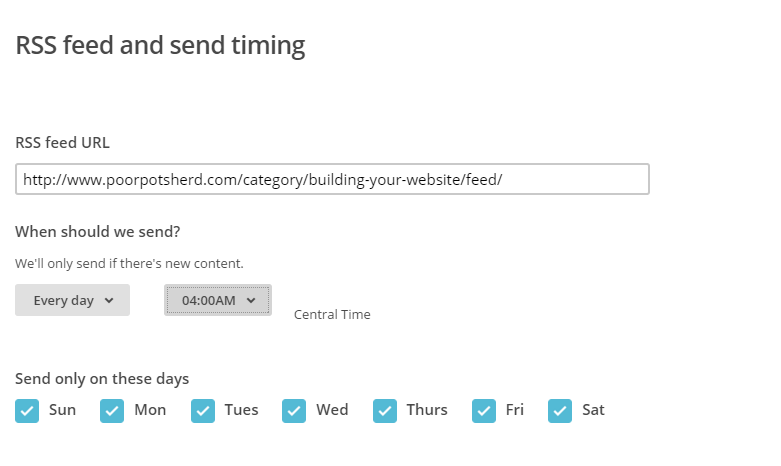 The next step is to make sure I send the updates to this blog category “Building Your Website” to the subscribers who checked “My Blog Project” on my subscriber form on my website. It would have been better if my blog category were also named “My Blog Project,” but it’s not and I decided not to try to change it now. 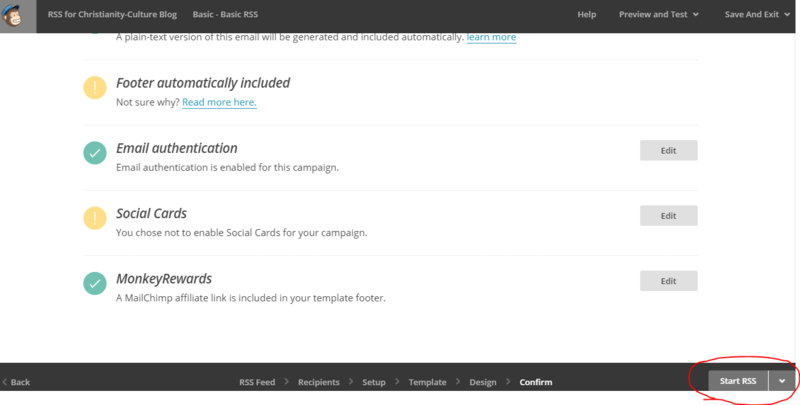 Next, Mail Chimp asks you to select a template and I just selected a basic 1-column template. I learned later, if I had scrolled down there was an “RSS feed” template to pick. I managed without it. 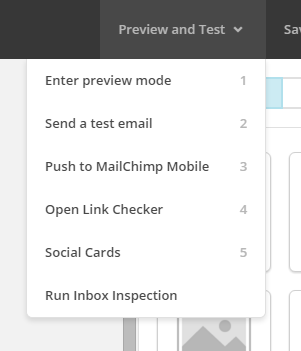 The “Design” tab lets you design your email right in Mail Chimp. You can drag and drop “parts” (my word) into your design and then edit each part. You have to delete the parts that already show, which are instructional. They don’t show up here, because I deleted them. But they say things like “You can put some text here.” Those lines don’t go away in the live email unless you delete them here. Note: I thought I had deleted these parts, but when I started getting emails, they showed up in my email preview. I went back to check on my design and though the words did not show up in the design preview, there was a text block that I couldn’t see unless I put my cursor on it. I deleted that text block and I think I have solved that problem. I am not sure why it the text block was still there. But if you have a similar problem, it may be something leftover that you can’t see unless you move your cursor around in the design. Back to finishing the design. Since I chose the 1-column template instead of the RSS template, I had add the RSS feed block manually. If I had chosen an RSS campaign template, that would have already been in there. The picture below shows you the parts I dragged and dropped on to my design. After you finish designing the email, you can text it by sending the email to yourself. I also tested by having some test emails in my subscriber list. Since I have two campaigns based on two blog categories, I had set up three test subscribers: one selecting “My Blog Project,” one selecting “Christianity and Culture,” and one selecting both, so I could see how that worked. But those couldn’t get tested till I launched the campaign. At that point I started seeing the problem I mentioned above about the email preview. So, as I have been saying, I have two blog categories. 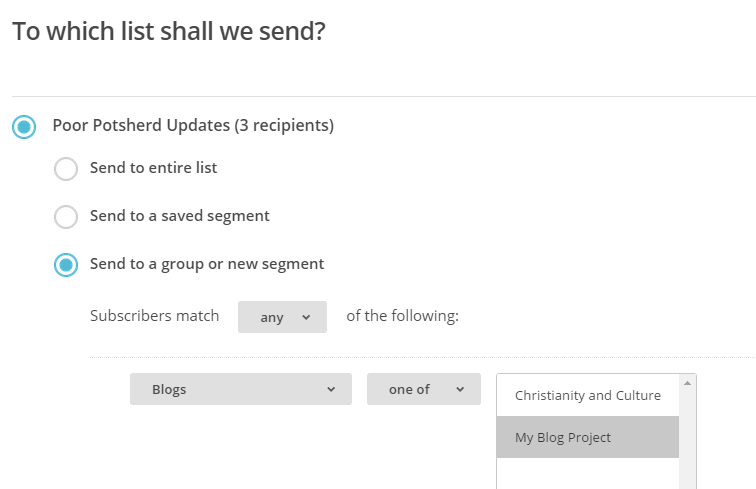 I now needed to set up the Mail Chimp RSS campaign for the other blog category which actually encompassed every category except “Building Your Website.” So I went through the same steps as above and I selected for recipients, the “Christianity and Culture” subscriber group. But the big difference was I needed an RSS URL that would either list all the other blog categories I wanted to send an update notice about or just list the one I wanted to exclude. 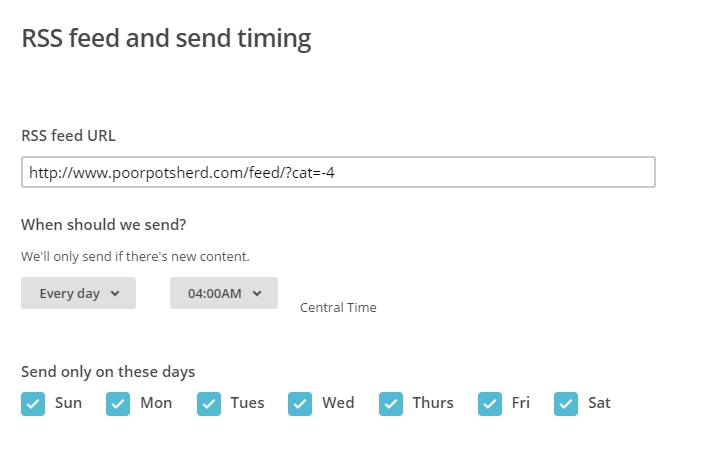 I did some different design on my second campaign and added a little different text, but this should help you design two Mail Chimp campaigns for two different WordPress blog categories.